Fifty years after Vermont passed a law banning billboards, a stretch the length of a football field on Burlington's Cherry Street is plastered with signs. 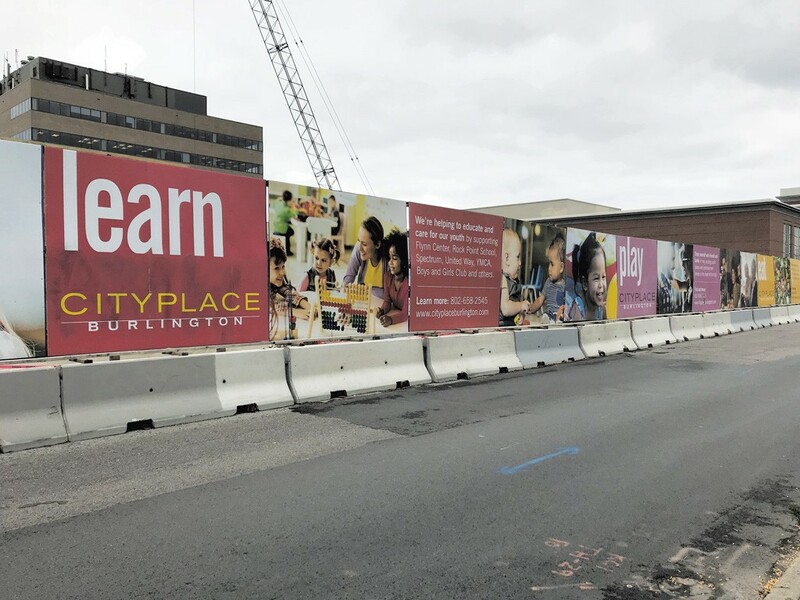 Many of the 8-by-10-foot advertisements for CityPlace Burlington, a stalled downtown development project, tout activities planned for the site — which is still a hole in the ground. They're among 61 such signs on two Burlington streets surrounding the project. "Eat," "play," "learn," "shop" and "work" here, the signs suggest. Corresponding images show fresh produce, toddlers touching hands and holding a Lego, and a couple smiling as they window-shop. On and on the signs go, down Cherry Street from St. Paul to Pine, with a similar set on Bank Street. One sign depicts project developer Don Sinex himself announcing "Our commitment to Burlington." But trumpeting that commitment on a series of large-scale signs is a violation of the state's billboard law, which regulates outdoor advertising, according to two State of Vermont lawyers with expertise in the legislation. WTF? Thirty-six contiguous signs line the south side of Cherry Street. They are erected on a wooden frame that is bolted to a set of concrete structures known as Jersey barriers. The signs advertise the multiuse development project and businesses that are currently open on-site, such as L.L.Bean and PacSun. In total, the Cherry Street billboards measure 2,880 square feet. The 1968 law (VSA 10, 488) banning outdoor advertising has certain exemptions, including an allowance for on-premise commercial signs at a maximum size of 150 square feet. The law forbids any such signs, regardless of their size, in a public right-of-way. While municipalities can impose stricter sign regulations than the ones permitted under state law, cities and towns cannot relax the standard, said John Dunleavy, an assistant attorney general and general counsel to the state Agency of Transportation. "Based on the information I have, it does appear to be a violation of the state billboard law," Dunleavy said of the CityPlace signs. "There is no authority to grant variances from this." Yet installing the signs was a requirement of the 46-page development agreement signed by Mayor Miro Weinberger and the developers on October 26, 2017. It states that the "signage and graphics" will "depict and describe the Project and its attributes, to communicate that downtown merchants are open for business during construction of the Project, and to engage the community." John Kessler, also an attorney for the state, agrees with his colleague that the signs run afoul of the law. He is general counsel to the Vermont Agency of Commerce and Community Development and serves on the board that regulates sign usage in Vermont. "The scheme as a whole was probably not well informed, or maybe it was not well advised, or both," Kessler said. "So, if we're saying that two signs (at 160 square feet) get you over the limit, we're essentially saying the whole concept was a mistake from the beginning." If these signs erected in a public right-of-way are intended to serve as "a secure barrier" between the construction site and public access, they are nonetheless not permissible, Kessler said. "What may be good for construction doesn't give you a blanket exemption from other laws that relate to signs," he continued. "They have to come up with a new way of doing this that doesn't involve outdoor advertising over 150 square feet. They have to get 36 [signs] down to less than two." In April, the transportation agency forwarded to the city a complaint about the signs made by a resident of Burlington's Cathedral Square, Dunleavy said. The email was sent to Bill Ward, Burlington's director of code enforcement, according to the agency. Ward told Seven Days last week that he doesn't remember receiving the email. "It doesn't appear that Burlington has done anything about that," Dunleavy said, explaining, "the state focuses on signs visible on state highways and leaves it to municipalities to enforce signs visible from town highways." In response to attempts to talk with Weinberger about the CityPlace signs, the mayor's office told Seven Days that Neale Lunderville, interim director of Burlington's Community & Economic Development Office, was the best person to contact. When Seven Days told Lunderville that attorneys for the state consider the signs a violation of the billboard law, he responded: "The city has a deep respect for the billboard laws. They are one of the reasons that Vermont is such a special place. If there is some concern about whether or not these signs violate the state's billboard law, that's something we will look into, and we will work with the developer to mediate, if necessary." Burlington city attorney Eileen Blackwood said the city disagrees with the state's position that the signs are in violation of the law. "If they get in touch, we'll obviously take a closer look at the issue," Blackwood said. "I think generally these are seen as temporary construction signs. None of this is intended as advertising." 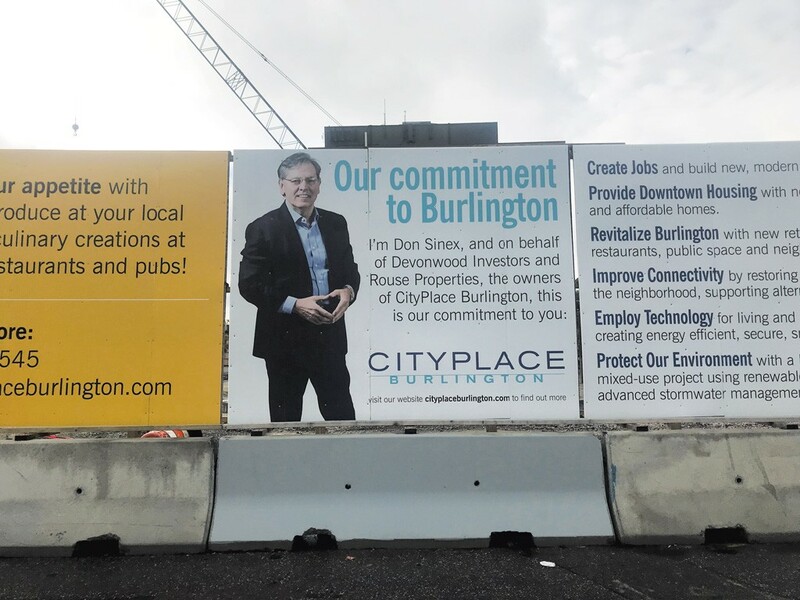 In an email to Seven Days, Sinex wrote that "[CityPlace Burlington] is committed to building this project in compliance with all applicable laws, including the Vermont law prohibiting outdoor advertising." He went on to call it "simplistic and misleading to compare" a "Vermont roadside advertising billboard" with downtown signage that "does not advertising [sic] anything but rather it provides information to the public about the largest private development in Vermont's history." Lunderville noted that while the city respects and wants to ensure it complies with the billboard law, its primary focus has been "what's happening on the other side of the fence." At the west end of the Cherry Street signs, the billboards give way to a chain-link fence marked "Danger Open Hole." Idle machinery is parked in the pit, where construction came to a stop two months ago. On the far side of the hole, across the construction zone at Bank Street, 25 CityPlace billboards rise in the street. At a combined 2,000 square feet, they are more than 13 times the legal billboard limit.